Kyra Bussanich, gluten-free bakery owner and four-time winner of Food Network's "Cupcake Wars" (with GF cupcakes against "regular" cupcakes! ), loves eggnog and eggnog lattes, so during the holiday season, she makes eggnog from scratch at Kyra's Bake Shop and uses it in everything she can. 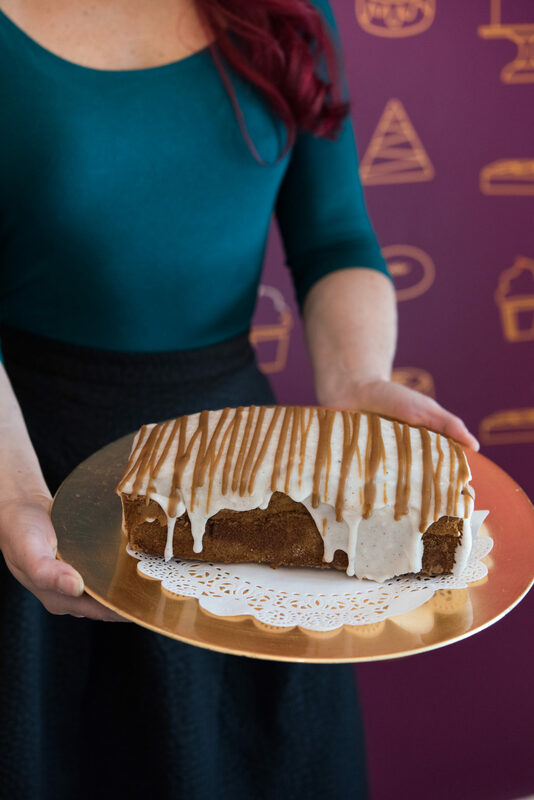 This deliciously heady, holiday-spiced gluten-free pound cake with an espresso kick pays tribute to her passion. It keeps best sliced, wrapped in plastic wrap, and frozen in an airtight container for up to two weeks or covered at room temperature for two days—if it lasts that long! Preheat the oven to 350°F. Spray a 2-pound (5 by 9-inch) loaf pan with gluten-free cooking spray or brush with melted butter. Sprinkle 2 tablespoons of granulated sugar into the pan, tilt to dust the bottom and sides, and dump out any excess sugar. Using a stand mixer with the paddle attachment, add the butter and beat on high speed until light and fluffy and pale in color, about 3 minutes. Add the remaining sugar and beat again until light and fluffy. Add the eggs, one at a time, stopping to scrape down the sides of the bowl, and mix until incorporated. In a separate bowl, mix together the potato starch, tapioca flour, rice flour, xanthan gum, baking soda, baking powder, salt, nutmeg, and espresso granules. Add a third of the mixture to the butter mixture and beat on the lowest speed just to combine. Add the sour cream and mix to combine on low speed. Add half of the remaining dry ingredients and mix on low speed to combine, then add the milk and bourbon and mix on low just to combine. Sprinkle in the remaining dry ingredients and stir the batter by hand just to combine. (Be careful not to overmix or the texture will become tough and rubbery.) Pour the cake batter into the prepared loaf pan and bake until golden brown and a toothpick inserted in the center comes out clean, 43 to 48 minutes. Line a baking sheet with parchment paper. Cool the cake in the pan for 1 hour, then turn the cake onto cooling rack set over the prepared baking sheet to cool completely. Whisk together the glaze ingredients in a bowl until smooth and shiny; add more sugar if it's runny. Pour over the cooled cake and let sit until set, about 90 minutes.